Some people — mostly southern people, I’d say — are obsessed with them. Other people — usually not southern people, probably — absolutely despise them. If you’re southern, or remotely had a southern relative anywhere in your family, I think they’re just in your blood. Growing up, my family didn’t eat grits. We ate “hominy.” And we ate it for breakfast with eggs, and for dinner with fried fish or quail. That dish of creamy, gritty goodness just warms my soul, literally and figuratively. It’s my comfort food. I’ve been known to cook all kinds of grits — the regular kind you slowly cook for half an hour, and the quick kind that are ready in five minutes. Because sometimes when you need grits, you have to have them right now. Every food, it seems, no matter how humble, eventually becomes trendy or part of some culinary revolution. 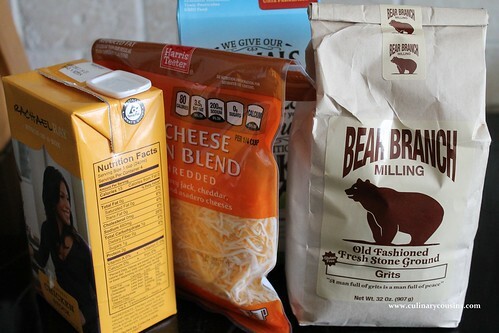 Enter stone-ground grits, which seem all the rage right now. Your mama’s box of Quaker just won’t do anymore. You need artisan grits of the stone-ground variety. I’ve come to learn that stone-ground just means that the texture is a little more coarse. The “gritty” texture of grits in general has never bothered me, but I know that’s some people’s hangup, the genesis of the hatred I mentioned above. So I was intrigued about trying this stone-ground variety, even if it meant an extra couple of dollars per bag. The price of “hot” and “now.” When I stumbled on a bag from a local company in the grocery, I thought, great! I could satisfy a culinary adventure and support local providers in one fell swoop. Some people make their grits with water, which is … fine. Some people make it with milk, which is better. But ever since my mom made the Crook’s Corner shrimp and grits recipe, there is no other. A blend of milk and chicken stock give it a hearty base of flavor and creamier texture. Then you must load up on the most important grit components. Salt. Butter. Lots and lots of both. I ate undersalted cheese grits at Hill Country Chicken in NYC, and I am here to say: There is nothing worse than too little salt in grits. It’s an abomination. 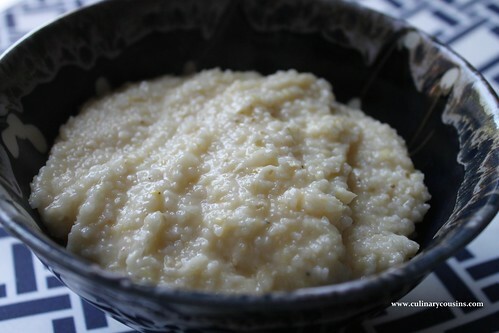 The stone-ground grits I bought made creamy, smooth grits with a beautiful texture. Once prepped with butter, salt and cheese, I ate them out of the pot with a spoon. No really, I did. Who has time for utensils when that’s in front of you? Pshaw. Please know that grits aren’t just for breakfast anymore. There are no rules. Serve them with sauteed fajita vegetables, baked or fried fish or shrimp, beef stew, tomato sauce. The possibilities are endless. Add the water, broth and milk to a medium saucepan. Stir in the grits and salt. Bring to a boil over medium heat, stirring occasionally. When the water is just starting to boil, turn the heat to low and cover. Let it cook on low for 25 minutes, removing the cover and stirring occasionally to prevent lumps. 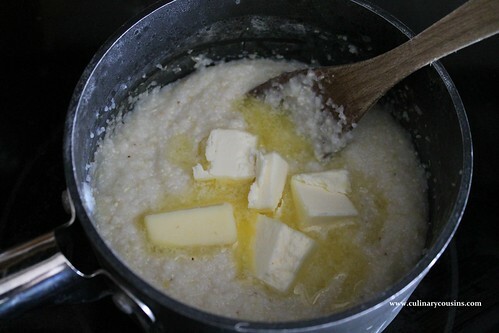 Then remove from the heat and stir in the butter and cheese. Add a few grinds of fresh black pepper, if you wish. Taste, and adjust seasonings if you need to.